Tom’s study of the American Civil War has primarily focused on the people who fought in the war, who they were, what their role was in the Civil War, and what was it about them that made them significant characters in that great conflict. His previous presentations on John Buford, Winfield Scott Hancock, Robert Gould Shaw, Ambrose Powell Hill, US Grant, and most recently Jeb Stuart, covered their lives including their family history, education, military background, roles in the Civil War, and in the case of Hancock, life after the War. Tom has always been more interested in the study of people and relationships; why people do what they do, what were their relationships, and how these relationships helped make these individuals who they were. While the Battle of Gettysburg has traditionally been labeled as the Highpoint of the Confederacy and the turning point of the Civil War, there is another conflict that in Tom’s years of studying the Civil War was as important, if not more so than Gettysburg; that conflict is the Battle of Antietam. 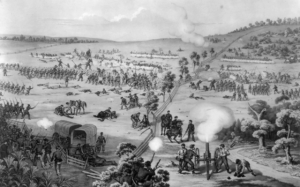 Tom’s research on Antietam has uncovered many critical events and factors proceeding September 17, 1862, that influenced dramatically what occurred on the outskirts of that little Maryland town by a lazy flowing creek. This is the first of a two-part presentation, to be concluded next month.